A few weeks ago I stopped over in the Galleria for a quick glass of champagne at Morton's Steakhouse. While I usually try to avoid going to the Galleria area due to the fact that it's extremely busy and has a ton of traffic this day was different. It was lunchtime and finally a little sunny. We've had an extremely cold and windy Winter for Houston this year and I was ecstatic on this day where I could finally sport a sleeveless dress. Scallop details are such a sweet touch. 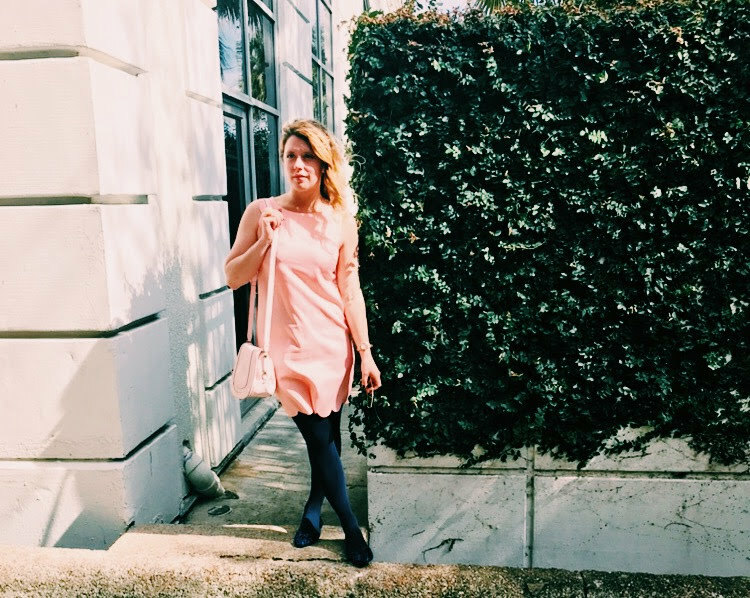 I wore this dress last Spring in this post and pulled it out of my closet for a new twist. I love how these sequin flats perfectly matched these navy tights. With a simple two toned color outfit, I felt like the scalloped hemline and sequin flats gave the whole look a little flair. If you are looking to elongate your legs, pair your shoes with the same hue of your tights! Such an easy trick and looks so polished. If you are in this area there are several delicious places to grab a bite. Cafe Lili has some of the best Mediterranean food in the city. Maggiano's has a wide range of delicious Italian food. Season's 52 carries a seasonal all organic menu and nothing over 600 calories which in and of itself is so impressive.